What it’s about: E.T. Darth Vader. C-3PO. Cloud City. The original Battlestar Galactica ship. The ship from Close Encounters. 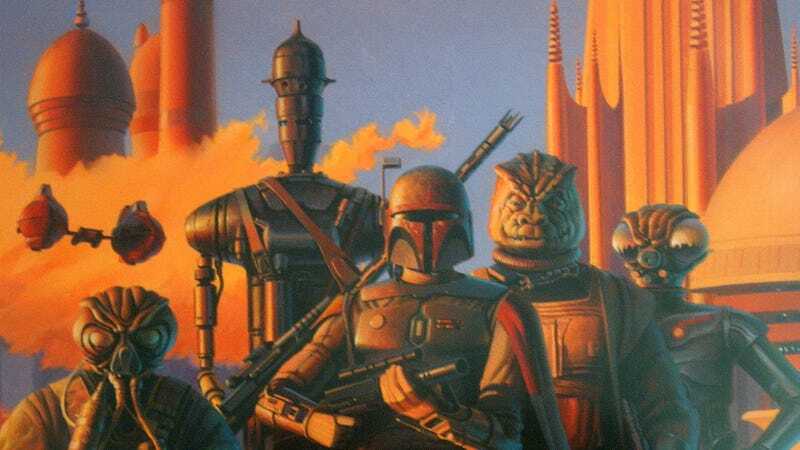 Some of the most iconic images in all of sci-fi came from the mind of Ralph McQuarrie. Hired by George Lucas to create concept art for the original Star Wars, his vision established the look and feel of the saga, and set the standard for a lived-in galaxy that stood apart from antiseptic sci-fi that had come before. Strangest fact: Star Wars also got McQuarrie into the book business. Star Wars was a rare film whose novelization came out nearly a year before the film itself. The 1976 paperback Star Wars: From The Adventures Of Luke Skywalker featured the concept designs for the characters on the cover (as the actual costumes and props of the film hadn’t been built yet). The book’s publisher, Judy-Lynn Del Rey, liked McQuarrie’s work enough that she hired him for 22 more book covers for her own imprint, Del Rey Books. Thing we were happiest to learn: McQuarrie’s most iconic creation—Darth Vader’s armor—came fully formed. Lucas simply asked him for “a very tall, dark fluttering figure that had a spooky feeling like it came in on the wind,” and possibly wearing a spacesuit. It was McQuarrie who came up with Vader’s breathing apparatus and samurai-inspired helmet, and his concept drawings are nearly identical to the finished costume. The same goes for the Stormtrooper helmets he designed. C-3PO and Chewbacca went through a series of changes, as C-3PO was originally based on the robot from Metropolis, and Chewie looked less and less like Lucas’ dog, Indiana, with each change in his design. Also noteworthy: McQuarrie had the good sense to bow out of the galaxy far, far away before work began on The Phantom Menace. He announced he had “run out of steam,” and retired. (One wonders whether the prequel trilogy’s CGI-heavy aesthetic would have improved with McQuarrie setting the tone.) Some of his unused designs from the original film were later used in the Clone Wars and Rebels animated series (as well as Rogue One, according to IMDB). Best link to elsewhere on Wikipedia: Long before J.J. Abrams rebooted sci-fi’s two biggest franchises, McQuarrie was the first to work for both Wars and Trek. By the time the original Star Wars had wrapped, he had already been hired by Gene Roddenberry to work on a big screen version of his TV cult hit. Star Trek: Planet Of The Titans was planned for a 1978 release (after Roddenberry’s script for Star Trek: The God Thing was rejected by the studio in 1975). The story involved the crew of the U.S.S. Enterprise visiting the home planet of the Titans of ancient myth, and then traveling back in time to teach prehistoric man the secret of fire. But rather than wanting to capitalize on Star Wars’ success, Paramount executives were convinced fans wouldn’t want to see two sci-fi films in the same year. Instead, they planned a new TV series, Star Trek: Phase II, which was also scrapped and reworked into Star Trek: The Motion Picture. Further down the Wormhole: The last film McQuarrie worked on was 1990’s Nightbreed, Clive Barker’s attempt to make “the Star Wars of horror films.” The film flopped, but with more than five times the budget of Barker’s iconic Hellraiser, he and McQuarrie were able to raise the bar for horror movie visuals. Barker laments that the studio didn’t really know what to do with the movie, marketing it as a generic slasher film. Slasher movies have been one of the most commercially successful type of horror, thanks to a boom in the 1980s. But the genre owes a tremendous debt to Italian giallo films of the ’60s and ’70s. We’ll peek through our fingers at that gory genre next time, just in time for Halloween.